Is it time to replace your Injen Air Filter? Injen Cleanable Performance Air Filters are made of top quality materials and are built to last. If you already have an Injen Intake system and want to use one of these filters, all you have to do is pull off the old filter and replace it with the Injen/AMSOIL filter. There are no additional modifications required. 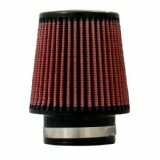 Injen replacement air intake filters can also be used with any other brand of intake that you want to bring our quality filtration to. The part number for this Injen Replacement Filter is X-1017-BR.